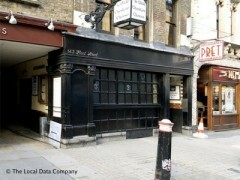 About: Ye Olde Cheshire Cheese has a real olde world feel to it, having survived through the reign of 15 monarchs. It consists of a great number of bars and dining rooms reached by a labyrinth of passages and staircases. It is decked out with a dark wooden interior. Bar food is served as well as beers, traditional ales, wines and spirits, and there is also a restaurant. They can cater for private parties of up to 120 people. If you’re going to drink in the Cheshire Cheese then you’d better have good eyesight because this is one of the darkest pubs around. Built about a zillion years ago, the place retains all the ancient beams, strewn sawdust and wheat sheaf decorations that history gave it. And it’s huge and beautiful. The dim and maze-like Ye Olde Cheshire Cheese is so proud of its ancient heritage that it still has sawdust sprinkled on the floor. More attractive classic features include the wooden chamber rooms that you’ll find dotted around the pub and the odd historic artifact on display. Oscar Wilde often frequented this famous journalist’s boozer. Dark, traditional and slightly dingy now, it was probably much the same back then. The poet Lionel Johnson is also said to have drunk here… and died, after falling off his stool.